I forgot to post this yesterday, but I've been listening to some great music lately and I didn't want to skip it! If you only watch one video, let it be this. I am OBSESSED with this song. I listen to it multiple times a day. No joke. It's easy being nice. It's easy being non-confrontational. It's easy choosing no side. But as the saying goes, if you stand for nothing you'll fall for anything. And if you care more about being "nice" than doing the right thing, you aren't nice. You're shallow. I just came across the Cuppow and I'm a little bit in love. I can't even lie. 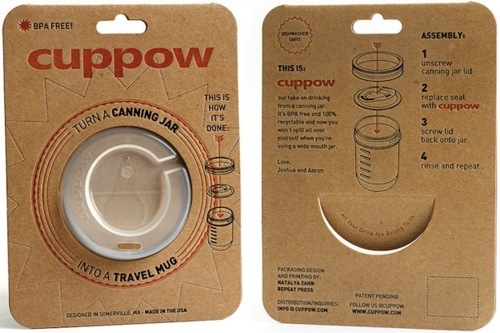 This is CUPPOW - our solution for easier drinking from a canning jar. The canning jar already makes an awesome platform for a travel mug: it’s easy to clean, made of heat-resistant glass, cheap, durable, and when sealed it doesn’t leak. 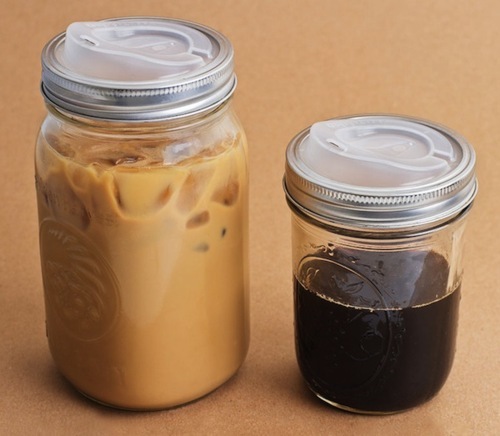 The only problem is that with their large openings, canning jars are not great for spill-free sipping while on the move. So we adapted it - made a new lid that lets us drink like a boss from virtually any wide-mouth canning jar. It’s a simple eco-friendly alternative to poor-performing and messy disposable hot cups, and over-built and expensive travel mugs. Cuppow was conceived of and designed by Joshua Resnikoff and Aaron Panone, and we’re proud to have developed a product that we look forward to using every day. That means it works great, it’s super durable, it’s made in the USA, it’s BPA free, it’s recyclable, and it doesn’t break the bank. Even though this won't really work for warm drinks, it's still pretty brilliant for picnics. I just wish more than one came in a pack, but I will definitely be ordering some. I didn't mean to go so long without blogging again, but I had a busy week. I had a midterm for my Interest Groups (lobbying) class and it was brutal. I'm not sure I did okay, but I'm just glad it's over to be honest. I love school but I'm ready for summer. 2. Breakfast makes all the difference. I know that's a major "duh," but I find myself slacking a lot on this and it makes a HUGE difference. If I eat breakfast I'm more likely to do well throughout the day and number one doesn't become as big of a deal. 3. One day I decided I had to have pizza and it made me feel awful. It upset my roommate's stomach too so maybe it was the pizza itself and not just carb overload, but it also messed with my *ahem* bathroom schedule. That's about it so far. Even though I still struggle with hunger sometimes (which means I'm not eating enough fat or something), I feel better when I'm not being weighed down with a crap ton of grains. I feel like I should mention that I had a few days of slight dizziness in the first week. Since I also gave up soda (for the most part) it might have had something to do with that though. Overall I'm really enjoying eating this way and I have lost some weight. How much of that has to do with this diet I can't really say. Also, it's Women's Week at the University of Utah this week and I got to hear a really motivation speech on Wednesday. The speaker, Dr. Cynthia A. Bioteau, is the 7th President and first woman CEO of Salt Lake Community College. During her speech she played a video called the "Girl Effect" and it completely blew me away. Did you know that women will reinvest 90 cents of every dollar they make compared to 35 cents for men? Craziness. Besides that I've just been busy hanging out and going to the gym. Boring I know. Hope everything is going well for everyone else! "I hope you will have a wonderful year, that you'll dream dangerously and outrageously, that you'll make something that didn't exist before you made it, that you will be loved and that you will be liked, and that you will have people to love and to like in return. And, most importantly (because I think there should be more kindness and more wisdom in the world right now), that you will, when you need to be, be wise, and that you will always be kind." This year has already been heartbreaking and amazing and more than I could have hoped for. So I think it's perfectly suitable. The nice thing about your life falling apart is the time you can take putting it back together. You can be a little more thoughtful and a little more picky about some aspects of your life. Things you tolerated before are no longer acceptable and in some ways big changes seem a littler easier to accomplish. I have no idea why that is. Maybe it's just perspective. 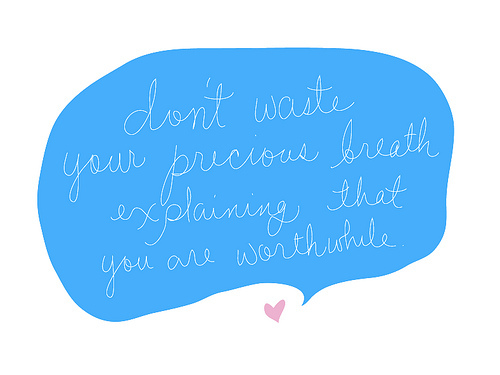 There's nothing like a good slap in the face from the universe to gain a little perspective in my experience. As the sting in my cheek starts to fade, there are a few things I'd like to accomplish this month. I like going to the gym. It has more to do with being balanced then anything else, but it feels good to sweat. Its feels good feeling strong. The fact I'm dating and strangers have to see me naked now is only a small part of it. I love to swim. It's the one tiny bit of athleticism I have and growing up in San Diego meant I spent most summers in the pool. (I'm talking all day every day in the pool.) Watching other people swim at the gym makes me want to jump in even more. I just need to buy a bathing suit, but I'd like to find one by the end of the month if possible. I've been putting this off for months. 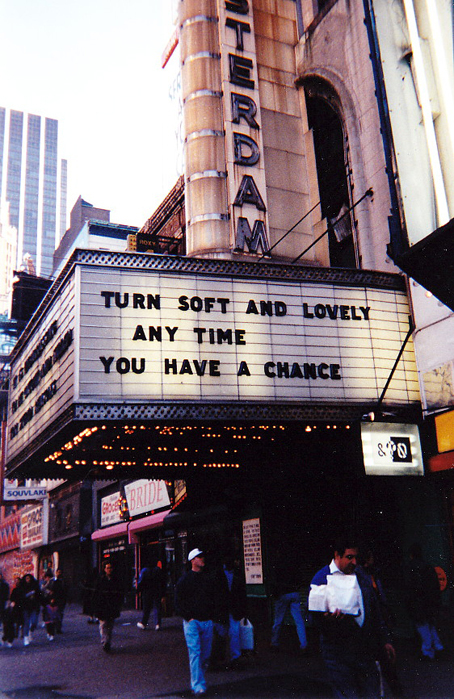 Now is the time. 4. Stick to my "diet"
I hate calling it a diet. I'm not on a diet. I'm changing the way I eat. There's a difference. I haven't been adhering to my "diet" perfectly, but I've been doing pretty well and I have every intention of continuing. (Since I'm not on a diet though, perfect adherence isn't necessary. See how great that is?) I also want to focus on drinking more water. I'm not so good about that. I've been thinking about volunteering forever now and I want to get started this month. Goals goals goals. Everyone has them. Very few follow them. I don't want to be one of those people. It's Thursday again already! What is this craziness? This is a little different from what I normally listen to, but I like it. It's super catchy and perfect for soundtracks. This is totally a guilty pleasure song, but I don't care. I love it. I love how the lyrics and the style of the song kind of clash. I want to print this out and cover the world with it. This video came out a while ago, but I've fallen in love with it all over again. Everything about it, right down to the song itself, is simply perfection. The clothes, the vintage feel, the makeup (OMG the makeup). I want to just live in this video. I'm trying to convince myself that it'd be totally reasonable to walk around with my makeup like this. Fake tear tracks and everything. I adore it. 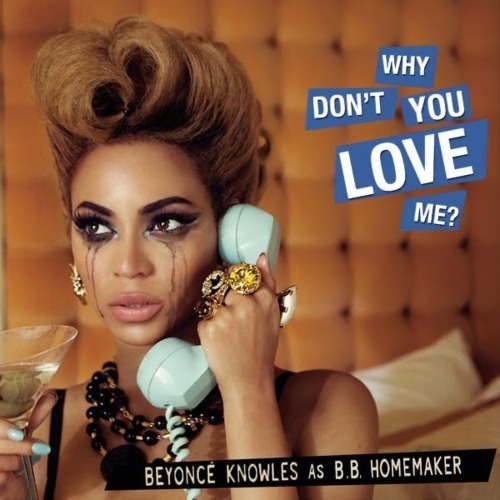 The fact Beyoncé did it herself is even more impressive. I was still thinking about Bettie Page, and wanted to do something that was inspired by her. This video was a secret: I paid for and co-directed it and didn’t tell my label or my management. The clothes and jewelry are from my closet, the wigs are mine, and I did my own makeup. We did eight looks in one day in this great house that belonged to a producer who worked with Dorothy Dandridge. He had pictures of her on the wall, so her spirit is in the video, too. I love Super 8 film and wanted to get those saturated colors. It’s a different drama—the tears and martinis and cigarettes. I wanted to channel the past for the present. I feel like I need to run out and buy some new lingerie. There's only about an hour left until it's Friday, but it's still technically Thursday! And I've been listening to tons of music lately. It makes me feel whole and unburdened. This song makes me think of my roommate and Las Vegas. So obviously I love it. The first minute and a half isn't much, but then something nice happens. This song makes me think of words like "delicate" and "lovely." So so pretty. If you're looking for a quick easy dinner, then look no further. Simple to make and easy to individualize, these chicken wraps are perfection. Not only does a food processor make the whole thing come together in just a few minutes, this dish is easy to stretch by bulking up the veggies and adding in extras like rice. I haven't had PF Chang’s lettuce wraps myself, but my roommate told me they reminded her of them without any prompting at all! I did make a few changes. Instead of cutting the chicken breast into cubes, I pulsed it a few times in the food processor to make small chunks. I also cut up all the veggies in the processor to make the pieces uniform and to save some time. Besides that, I threw in a jalapeno and added a little sriracha to the mix at the very end for added zing. I also left off the pouring sauce and threw in some white rice to make the dish go even further. 1. In a large bowl, dissolve sugar in 1/2 cup warm water, then add soy sauce, rice wine vinegar, ketchup, lemon juice and sesame oil. Mix well and throw in the fridge until you’re ready to eat. 2. Just before serving, combine 1 teaspoons hot water with dijon mustard and garlic and mix in small bowl. Add to the pouring sauce, 1/2 a teaspoon at time to taste. 1. Prep the stir fry sauce by mixing soy sauce, brown sugar, and rice vinegar in a small bowl. 1. Combine oils and add to wok or large frying pan. Heat oil over high heat until it glistens, about one minute. Add chicken and saute until mostly cooked through, about 5 minutes. 2. Turn the heat under the wok down to medium-high. Add another tablespoon of olive oil to the pan, wait one minute, and then add garlic, onions, water chestnuts, mushrooms, and the stir-fry sauce you prepared earlier. Stir-fry everything until the mushrooms have cooked through, about 4 minutes, and remove to a serving dish. 3. 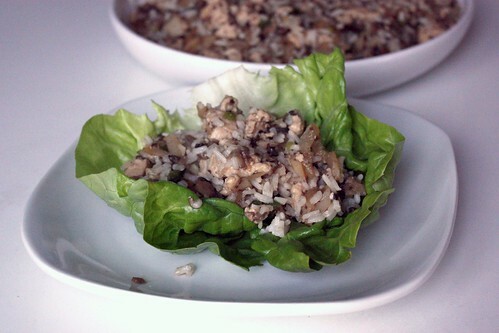 Serve stir-fry with iceberg lettuce or nappa cabbage leaf wraps and top with pouring sauce. Variation: you can do the same thing with ground beef, if you like. 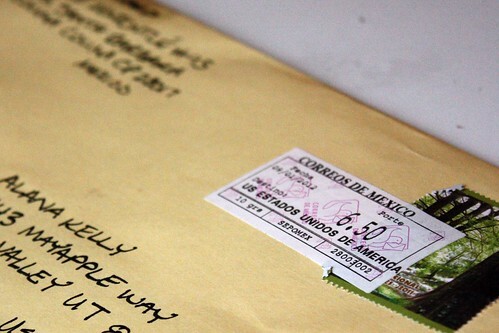 I never get anything interesting in the mail. I usually don't even check it for days since junk mail and the occasional food magazine are all I usually get. So imagine my surprise when I got not one, but two, awesome things in the mail yesterday. 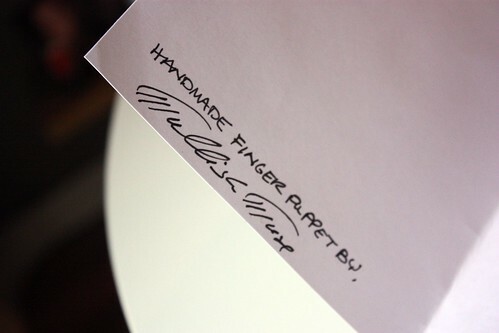 One day I thought it would awesome if I had a Pamela Anderson finger puppet. (I have no idea why. I'm a weirdo sometimes. Like twelve year old boys everywhere, that red bathing suit just does something for me I guess.) 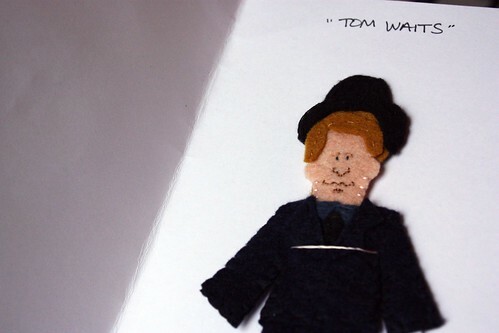 While I wasn't able to find one, I couldn't resist this adorable Tom Waits finger puppet. 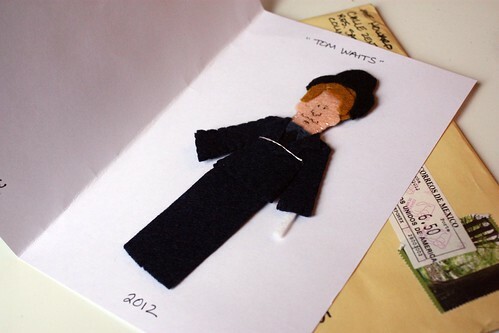 I have a friend who adores Waits and I thought he'd get a kick out of it. Since the puppet came from an artist in Mexico though, it took two months for me to get the little guy. I even did my happy dance at the mailboxes. My new neighbors were very impressed. 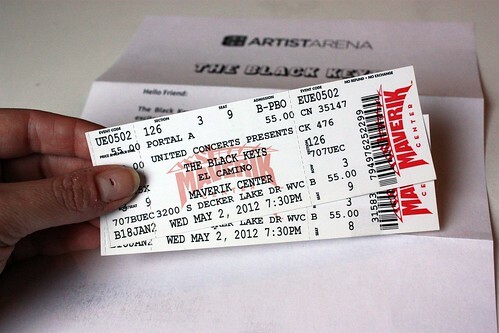 And if that wasn't enough, I also got my tickets to see The Black Keys in May. How I'm gonna keep track of these bad boys for two months is beyond me, but it was a nice surprise either way. I went on a date with someone who was on the paleo diet last week. 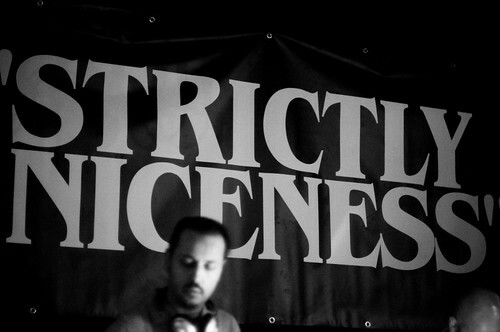 I had heard of it before because of Dooce, but I'd never really given it much thought. After a few hours on google and a lot of curiosity, I've decided this paleo thing may not be totally insane. I've been under a lot of stress lately and a new way of eating maybe just the thing for me. Now I'm not a scientist or an evolutionary biologist, so I'm definitely not the one to say what is or isn't an appropriate diet for anyone. The thing I like about this way of eating in particular is it feels right to me for the most part. In my mind it makes sense to limit sugars, processed foods, and grains. I'm not saying I'll ever give up some things, like sweetened tea or tequila, but I can get behind the idea that most of your food shouldn't come out of a box. Anyone who cooks most of their meals will understand. This isn't to say I don't have issues with some of the paleo "rules." First of all, animal fat is pretty gross to me. The no dairy thing is also kind of an issue for me. I have no intention of giving up cheese or cream and there are a lot of contradicting opinions about dairy within the paleo community. I also plan on having some rice in my diet which is another touchy topic from what I've read. For me this is more of template to keep in mind rather than a strict regimen. At the end of the day, life is short and you should eat what makes you happiest and healthiest. And maybe a gluten-free diet is just what I need. If anyone has tried something similar I'd love to hear about your experience! All I want is someone to feel this way about me one day. Is that too much to ask? I've been making some changes in my life and I want to blog about it, but it's been far too long since I posted a New Music Thursday. New music always helps me clear my head. It's an easy way to focus on something other than your problems and it's kind of exciting. I love coming across little gems of music. This has got to be one of the most interesting videos ever. The treadmill one is still my favorite, but wow. I love to have this song on while I get dressed. More times than not I end up dancing around my room like an idiot. I heard this song for the first time on the way to Vegas and wow. That's all I really want to say about that.